Since upgrading to the iPhone recently, I decided to try out a few different money earning apps. After doing some research, I narrowed it down to 3 apps (Gigwalk, Field Agent, and EasyShift) which pay you to go to stores and take pictures of products. Each app is available for iPhone and Android devices. Gigwalk - The first one I downloaded was Gigwalk. I had heard of this one long ago but this was the first opportunity I had to try it out. The registration was pretty easy and I was able to view gigs right away on the map and in list form. The layout is pretty easy to use, but the downside so far has been that there are not too many gigs close by. Most have been at least 10 miles away which is too far to go for gigs listed at $6-7. So far I have not found any close enough to try yet. Field Agent - Next I tried Field Agent. They seemed to ask more questions during the set up. They also have ongoing qualifying surveys to become eligible for additional jobs. Like Gigwalk you can view the available jobs on a map and in list form. 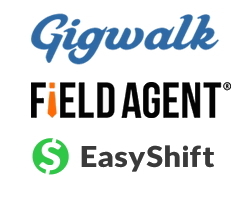 I found there to be many more opportunities available on Field Agent compared to Gigwalk, many as close as a few miles. They have product auditing jobs, surveys, and scavenger hunts which entail finding certain items in a store and getting pictures of them. Most jobs pay about $3-7. I have not completed any of the jobs yet, but so far this one looks promising. EasyShift - Lastly, I downloaded EasyShift. This one seems to be the most simplified of the 3. One feature I liked is for the terms of service, they have each part explained in plain English. They had a fair amount of shifts available within a reasonable distance, but for some reason, most of them are for liquor stores. There is nothing wrong with that, but it is something to keep in mind. Average shifts pay about $5-7. Of the 3, so far it looks like Field Agent may be my favorite because it has the most opportunities and a variety of different tasks. The interface also seems to be the most engaging. I will update here if I have a follow up on these money making apps. Have you tried any of these 3 apps before? Do you recommend any similar apps for earning money? Feel free to leave a comment below. Hi, yes I have been trying them out and so far I have found the best one to be Field Agent. They have the most opportunities close by and the tasks are pretty straight forward. I have not found anything close by using Gigwalk. Also have not been able to find any good gigs on Easy Shift yet. They are all free so it is worth trying them out in case there are more opportunities in your area. A significant difference between these apps post is the amount of time allowed for completion. Field Agent is 2 hours, Easy Shift is 24 hours, and Gigwalk is anywhere from 1-2 days up to 2+ weeks. Countdown starts when the job is reserved. Easy Shift allows shifters to see jobs reserved by others whereas the other two do not. ES and GW payout to PayPal automatically, FA requires a request then pays to PayPal. They all pay quickly, anywhere from a few minutes to two weeks with the standard being 1-2 days. Currently, ES does not penalize for incomplete or dropped shifts, the others do. ES is extremely photo requirement focused while the others are minimal in photos required. GW's app and QA team seems to be far more involved and effective than the others. FA and ES have a lot of typos and editing type issues whereas GW has very few overall. There is also a better flow and obvious forethought with GW's jobs. GW's and FA's app is much more stable as well. ES is not as clear and jobs have a lot of redundancy. ES provides a [moderated] forum for users and allows detailed discussion and promotion of other apps and opportunities. For rejected jobs, FA sends all of the information to you (Q&A, photos, etc) with a detailed reason for the rejection. They will reverse a rejection decision if you can show or explain on appeal. GW will actually reassign you the job with a note/message explaining what is needed (rarely is there a need for appeal with them), and ES is just a black hole where appeals are concerned. Sometimes, there isn't even any notification of a rejected shift. The reason is usually very ambiguous and since you don't get to see what you submitted it's tough to plead your case. And after review you won't know any more than you did before, they don't notify you after. Depending on your area, the availability of shifts varies greatly. I've found it's mostly feast or famine with all of them. They all have postings about the same time. They all seem to have droughts at the same time. Larger metro city areas will have a lot more opportunities than smaller towns and communities. Probably most important is the pay. For all apps (not just these three) the pay has continued to sink lower and lower making the cost of completing the jobs more than the pay unless you're able to create a route or catch a decent paying gig (GW pays far better than the others). What used to be $6-$7 is now $3 with more requirements. That's about it in a not-so-small nutshell. They all have pros and cons. Try them and decide for yourself! Thank you for the detailed reply and additional information on these apps! Thank you for the detailed review. I appreciate your sharing your knowledge with the rest of us.